Panettone (pronounced /ˌpænᵻˈtoʊni/; Italian: [panetˈtoːne]) is a type of sweet bread loaf originally from Milan (in Milanese dialect of the Lombard language it is called paneton /paneˈtuŋ/), usually prepared and enjoyed for Christmas and New Year in Italy, southeastern France, Spain, Portugal, Slovenia, Brazil, Venezuela, Peru, Malta, Montenegro, Albania, Eritrea, Georgia, Germany, Austria and Switzerland, and is one of the symbols of the city of Milan. In recent years it has become a popular addition to the Christmas table in the United Kingdom, United States, Canada, Puerto Rico and Australia. In South America, especially in Brazil, Peru, Argentina, Paraguay, Uruguay, Colombia, Bolivia, Chile, and Mexico. Each country names the special bread differently. In some countries it is a tradition to eat it on 7 January each year. It has a cupola shape, which extends from a cylindrical base and is usually about 12–15 cm high for a panettone weighing 1 kg. Other bases may be used, such as an octagon, or a frustum with a star section shape more common to pandoro. It is made during a long process that involves curing the dough, which is acidic, similar to sourdough. The proofing process alone takes several days, giving the cake its distinctive fluffy characteristics. It contains candied orange, citron, and lemon zest, as well as raisins, which are added dry and not soaked. Many other variations are available such as plain or with chocolate. It is served in slices, vertically cut, accompanied with sweet hot beverages or a sweet wine, such as Asti or Moscato d'Asti. In some regions of Italy, it is served with crema di mascarpone, a cream made from mascarpone, eggs, sometimes dried or candied fruits, and typically a sweet liqueur such as amaretto; if mascarpone cheese is unavailable, zabaione is sometimes used as a substitute. Efforts are under way to obtain Protected Designation of Origin and Denominazione di origine controllata status for this product, but, as of late 2008, this had not occurred. Italian Agriculture Minister Paolo De Castro was looking at ways to protect genuine Italian cakes from growing competition in Latin America and whether action could be taken at the World Trade Organization. In the early 20th century, two enterprising Milanese bakers began to produce panettone in large quantities in the rest of Italy. In 1919, Angelo Motta started producing his eponymous brand of cakes. It was also Motta who revolutionised the traditional panettone by giving it its tall domed shape by making the dough rise three times, for almost 20 hours, before cooking, giving it its now-familiar light texture. The recipe was adapted shortly after by another baker, Gioacchino Alemagna, around 1925, who also gave his name to a popular brand that still exists today. The stiff competition between the two that then ensued led to industrial production of the cake. Nestlé took over the brands together in the late 1990s, but Bauli, an Italian bakery company based in Verona, has acquired Motta and Alemagna from Nestlé. As a result of this fierce competition, by the end of World War II panettone was cheap enough for anyone and soon became the country's leading Christmas sweet. Lombard immigrants to Argentina and Brazil also brought their love of panettone, and panettone is enjoyed for Christmas with hot cocoa or liquor during the holiday season, which became a mainstream tradition in those countries. In some places, it replaces the King cake. In Argentina, Brazil (Panetone in Brazilian Portuguese), Chile (see: Pan de Pascua), Ecuador, Colombia, Venezuela, Bolivia, and Peru (known in Spanish as "Panetón" or "Pan Dulce"). Peru's Antonio D'Onofrio, son of immigrants hailing from Caserta, Italy, spawned his own brand using a modified form of the Alemagna formula (e.g., candied papaya is used instead of candied citron and lemon, as these fruits are not available in Peru), which he licensed along with the packaging style. This brand is now also owned by Nestlé and exported throughout Latin America. In recent years, Brazilian Panettone have increased in quality and in popularity due to their low cost and abundance. Italian food manufacturing companies and bakeries produce 117 million panettone and pandoro cakes every Christmas — worth 579 million euros. There is an event in Milan since 2013 that awards the Best Traditional Panettone of Italy. In 2016 the prize was awarded to Giuseppe Zippo, from Salento. Panettone is also very popular in Australia owing to the large number of Italian immigrants, and in some places, supermarkets make large displays of panettone near the front of the shop. Some non-Italians may use it as an alternative to the somewhat stodgier Christmas Cake. By 2011 panettone had become popular in the UK. In Italy the panettone comes with an often varied history, but one that invariably states that its birthplace is in Milan. The word "panettone" derives from the Italian word "panetto", a small loaf cake. The augmentative Italian suffix "-one" changes the meaning to "large cake". The origins of this cake appear to be ancient, dating back to the Roman Empire, when ancient Romans sweetened a type of leavened cake with honey. Throughout the ages this "tall, leavened fruitcake" makes cameo appearances in the arts: It is shown in a sixteenth-century painting by Pieter Brueghel the Elder and is possibly mentioned in a contemporary recipe book written by Bartolomeo Scappi, personal chef to popes and emperors during the time of Charles V. The first recorded association of panettone with Christmas can be found in the writings of 18th century illuminist Pietro Verri. He refers to it as "Pane di Tono" (luxury cake). Though the etymology of the word 'panettone' is rather mundane, three more complex and fanciful folk etymologies have arisen. It is also thought that one of the ecclesiastical brothers, Fr. Antonio, who always wore the proper hat, was fond of this Pane. The ecclesiastical hat Pane Tone was later adopted as the shape, which gave rise to Panettone. This derivation received credence and acceptability at the turn of the century, and is likely to be the foreunner of the more recent Christmas cake. Gianrian Carli in "Il Caffe" makes passing reference to Panettone in 1850 in discussion with Pietro Verri and alludes to a clerical hat. Prof. S Reynders. Dipartimento di Scienze del Linguaggio, Università Ca'Foscari (1987). One suggests that the word derives from the Milanese, "pan del ton", meaning "cake of luxury". Another states that a 15th-century legend from Milan gives the invention to the nobleman falconer Ughetto Atellani, who loved Adalgisa, the daughter of a poor baker named Toni. To help her, the nobleman disguised himself as a baker and invented a rich cake to which he added flour and yeast, butter, eggs, dried raisins, and candied lemon and orange peel. The duke of Milan, Ludovico il Moro Sforza (1452–1508), agreed to the marriage, which was held in the presence of Leonardo da Vinci, and encouraged the launch of the new bread-like cake: Pan de Toni (or Toni's cake). Wikimedia Commons has media related to Panettone. ↑ Cherubini, Francesco (1841) Vocabolario milanese-italiano, Vol. 3, p. 164. ↑ "EU agricultural product quality policy". Retrieved 6 December 2008. ↑ Saatchi. "Bauli: pandoro, panettone, colomba, dolci a lievitazione naturale, merende, cioccolato". Bauli.it. Retrieved 14 September 2012. ↑ Shaun Weston (1 August 2009). "News | Bauli acquires Motta and Alemagna from Nestlé". FoodBev.com. Retrieved 14 September 2012. ↑ Pomeroy, Robin (2007-12-12). "Panettone makers want to keep Christmas cake Italian". Reuters. Retrieved 6 December 2008. ↑ Bob Granleese. "Christmas taste test: panettone | Life and style". The Guardian. Retrieved 9 January 2016. 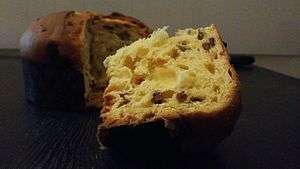 ↑ "Christmas taste test: Whose Panettone is best?". Newsshopper.co.uk. 14 November 2014. Retrieved 9 January 2016. ↑ "history of panettone, historia del pan dulce, panetón, traditions, christmas season, tradiciones, navidad, om personal, ingles gratis on line". Ompersonal.com.ar. Retrieved 2012-09-14.